"Btube Advantage Template" magazine style blogger theme. It automatically to the homepage of your recent article published in five separate categories. SEO features are full. Automatically creates a thumbnail. 1- To show posts in categories in homepage ,find this code and change value of each label and Title variables to your categories . 3- To change the logo should replace the link below. 41 Responses to "B Tube Advantage Template - Blogger"
hola ,necesito ayuda, no puedo ver los videos en la pagina principal, como hago? admin bunda bu tasarımda bu alttaki kod işe yaramıyor ben tekil sayfada resim görünmemesini istiyorum nasıl yapıcaz ? To create a homepage article thumbnail area code, along with video images also need to add code. Does not automatically create thumbnails. 1)sizin gibi logo bende tasarıma nasıl ekleyebilirim ? 2)o başlık yazılarının rengini nasıl değiştirebilirim ? Hi, thanks for the lovely template. I dont see any Blog Posts Widget (which b tube video template has below adsense widget) under design tab. Could you please tell me what might be wrong and how to fix it. Looking forward to your reply. Mr. LoveBD: Specify the widget, the design was ineffective because it is causing problems.This template is different from the standard themes of the blogger. The fact that the developing and learning. 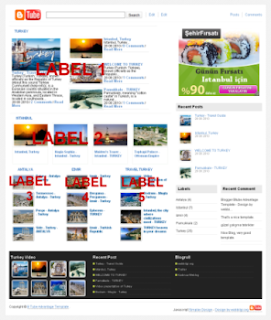 I really love this template and I just want to ask how to add another label in homepage aside from label 1 to 5. I am thinking to add another three at the bottom if it is possible. I am looking forward for your response. Thank you in advance!! Please copy and paste this section again. Is there any way to generate thumbnails of the video without putting the image manually , specially that occurs before with youtube videos in blogger tube template . Thank you so much web bilgi. I am looking forward for more great works from you. I'll be checking your works often. Have a nice day ahead! thanks a lot for this lovely template.its amazing.can you tell how to hide the date,time and author in this template? Single page to hide the author's name and date, locate and delete the following code. may I know how to automatically created thumbnail? It seem that no thumbnail even there are image embedded in that post. Please help me.. Thanks!!! and how do I create the thumbnail? can you give an example? thank you for any help..
mr "g3n" "B Tube Advantage Template" rss feed to automatically generate thumbnails "all" have to choose. I would like to say first, "videoseyredin.blogcu.com" is the theme of the blogger. Turkish Blog service, designed to blogcu.com. To delete the search box, locate the following code. alone do not remove this code. label 2, label 3, label 4, label, 5.
very important ... I await your response and thanks! mr Alexander Please observe the installation and use of explanations for the above template. mr Nedax. Above "kses" read the answer I gave to the question. have the answer to your question there. Sidebar, I hope you can help me and thank you very much! Benim başka bir tema ile ilgili sorum olacak. Tema tasarlayan biri olarak sorunu çözeceğini umuyorum. "template oggi" isimli temayı kullanmak istiyorum ama bir sorunum var. temada herhangi bir kayıta tıklayıp bir sonraki sayfaya geçince kayıtla ilgili yüklemiş olduğum resim açılan sayfanın görüntüsünü bozduğu için resmi yok etmek istiyorum.kayıta tıklayıp sonraki sayfaya geçince resim yok olsun yazı vs. ne varsa sadece o görünsün. ama ana sayfadayken görünsün resim. "chucky" temasını kullanırken bir kodla yok ediliyordu ama bunda bir türlü bulamadım. Eğer öğle bir kod yoksa bile herhangi bir kod ekleyerek yok edebilirmiyiz? diğer blog şablonları için anasayfada thumbnail gösterilmesini sağlamak için bir kod paylaşırsan sevinirim. how to add related post?